Most readers of my blog and twitter will know that my oldest son Lucas is quite shy. I wanted to do something to help him gain some confidence. We enrolled him in Taekwondo at the beginning of the year. He loves it and I have sat in on a couple of his classes, he’s come on leaps and bounds. He was at class on Sunday and decided he wanted to go for his grading which would take him up to the next stage. 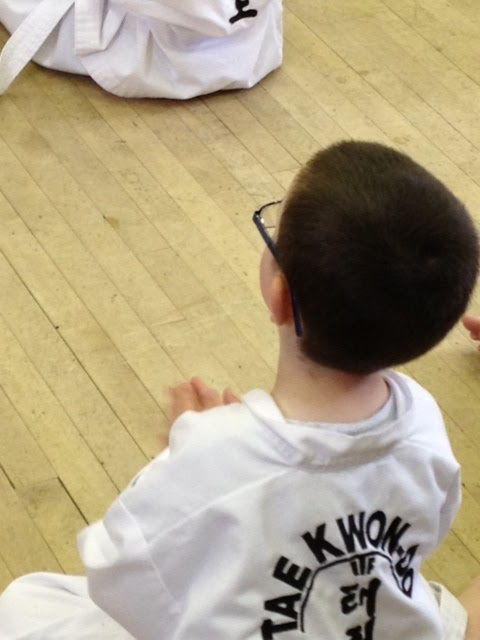 He would go back in the afternoon for 2 hours and do the Taekwondo steps he’d learned to see if he could pass. He was up for it and after the huge dent in our pocket for the grading he was off. We weren’t allowed in but we did sneak a few pictures of the day. Here he is waiting to find out if he passed. Taekwondo is great for keeping fit, discipline and self defence. Not forgetting it’s a huge amount of fun. I hope he keeps it up for many years to come. Although he does think he’ll be a black belt in no time. Lucas passed his grading and is now a white belt with yellow tags. 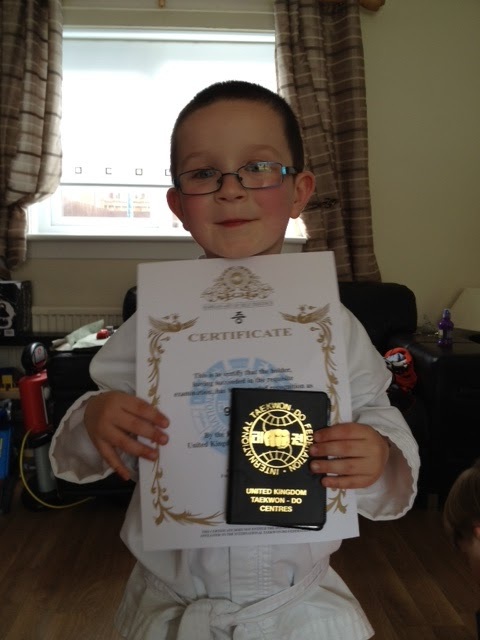 He is over the moon and so proud of himself as we are of him. His face was a delight when he came in to show off his certificate and his updated belt. Look at that happy face. What a star he is. Next on the list is yellow belt. Not sure when he will do this, but from his enthusiasm he will want it sooner rather than later. I am one proud mummy.